Having never been to the airshow at East Fortune before and with decent weather in prospect, I decided it was about time I made the journey from Edinburgh! So I travelled by train to North Berwick under clear blue skies in a cosy temperature to former RAF base, now home to the Scottish Museum of Flight and its extensive collection of exhibits. 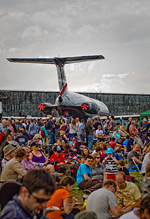 For the last three years the event has been run by Air Tattoo Event Services as part of a current deal. 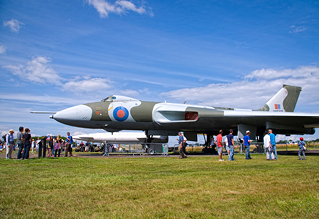 Chris Milne reports on Scotland's National Airshow at National Museum of Flight. Additional photography the author. There isn't much of a static at East Fortune because the old runway is inactive and used for car parking, so a replica Spitfire along with Sunderland museum's Auster were the only two exhibits present for the show, excluding the outdoor de Havilland Comet, Avro Vulcan and BAC1-11 museum exhibits. There were plenty of re-enactors which added a large degree of interest, especially since the infrastructure of the base has never really evolved from its WWII state! The only flying display item based at East Fortune was Phil Connolly's Vietnam era UH-1H Huey, which was a hugely anticipated act for me. The price of admission to the airshow includes the freedom to visit the museum's exhibition hangars which - although very tightly packed together - made up for the lack of a real static display. It was clear to see that the outdoor exhibits were in need of some new paint, in particular the ex-British Airways BAC 1-11, which was open for visitors to walk through. 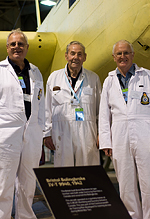 It felt good to be re-united with common airframes that I was used to seeing in service, such as the Jaguar, Harrier, Nimrod and Tornado F3, all of which are now retired and have a place in the museum. There were plenty of other exhibits of interest, an ex-USMC F-4S Phantom, a Luftwaffe Messerschmitt Me163 Komet and BAC Concorde 'Alpha Alpha', which was memorably transported over land and water to make the illustrious journey to the Scottish Museum of Flight. Just before 13:00 commentator Ben Dunnell announced the imminent arrival of the Typhoon to kick off the flying display, continuing on with a very informative description of both the aircraft displaying and the routines themself. Bang on time the RAF Eurofighter Typhoon, piloted by Flt Lt Jamie Norris from 29(R) Squadron at RAF Coningsby, thundered through with a fast banked pass. The new display has made an impression this season, being flown with much more vigour that in previous years and the dirty burner pass is very impressive. The Typhoon was not the only military act at the show. Later in the day the Shorts Tucano from Linton-on-Ouse would display with the light at its worst, which didn't allow the new scheme representing a section of 72 Squadron's WWII history to really stand out like it deserves to. The desert camouflage markings originate from when they flew with that scheme on their Spitfires for operations over North Africa. The Tutor's cancellation, due to a number of problems with the type this year, meant the BBMF Hurricane's solo (the accompanying Spitfire had to cancel) was the last RAF display at East Fortune but also the first time that PZ865 had displayed there in her new guise, replicating an aircraft of 34 Squadron of the South East Asia Command during 1944. A Hispano Aviacion HA1112 Buchon - a license built Bf109G disguised in Luftwaffe colours - was also present in the display, flying an excellent routine whilst the sun was still out, corkscrewing around the sky and showing a brilliant topside pass for the photographers. Another piston engined fighter aircraft of the same era was the North American P-51 Mustang. OFMC's "Ferocious Frankie" was originally booked to appear, but the on-going engine troubles with that particular aircraft led to a cancellation. Fortunately the UK is blessed with numerous examples of the type and at short notice Hardwick warbirds stepped in and sent the wonderful "Janie" to participate. Although the display felt very distant, it was nice to have a Mustang present at the show regardless. The RNHF's Fairey Swordfish with its Battle of the Atlantic tribute and an extremely manoeuvrable L-4 Grasshopper provided yet more WWII elements. 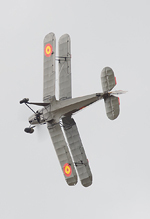 Another license-built German aircraft from Spain took to the East Lothian skies, the CASA-built Bucker Jungmann trainer in authentic Spanish Air Force markings looking fantastic against the stormy skies, definitely one of my personal highlights of the show! A civil touch was added with the inclusion of a few lighter acts, all of which were flown as pairs. 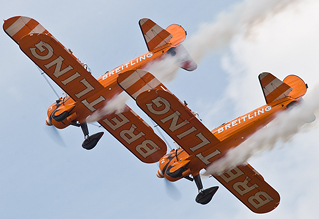 The first duo up were the Breitling Wingwalkers of Aerosuperbatics who are often seen at shows all over the UK with their two Boeing Stearmans in a loud orange livery with the wingwalking girls on top. As is expected, their display routine was pristinely flown, with very sharp crossovers. Next up were the SWIP team, who stole the best patch of sunlight during the show as their white Twister aircraft contrasted with the black sky. 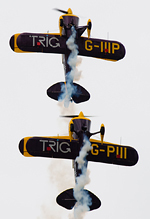 The final pair were new to me - two Pitts Specials of the Trig team, who flew very tight but their display seemed to lack direction. Star of the show for me was the seldom seen UH-1H Huey, although the display also seemed further away than I remembered it at Perth Airshow three years back. Sadly it displayed in dull conditions, which made the dark olive green helicopter blend in with the sky - as anyone who has tried photographing one of the RAF's helicopters in overcast conditions will attest to. 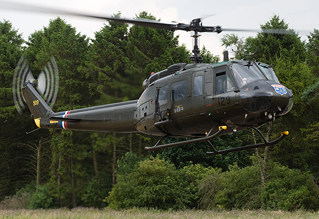 Thankfully photographers could capture the Huey against a background of trees as it landed and departed for its display and away home after the show. The only other rotary addition was to be a Royal Navy Sea King from HMS Gannet which sadly had to cancel due to being on task all day - a big disappointment but very understandable. Neil McCarthy's Jet Provost with its new scheme courtesy of Serco then flew a dynamic routine, much like the Hunter Flight Academy's T.7 earlier in the display schedule. 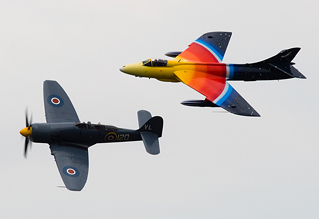 Another RNHF act was the penultimate item of the bill with the Sea Fury TB.20 in its dark sea grey scheme which, after performing its solo, flew a few tight flypasts in formation with "Miss Demeanour", which would then go on to close the show. Jonathon "Flapjack" Whaley, the pilot of the colourful ex-Swiss Air Force Hunter F.58, was another late addition to the show, replacing the F-86 Sabre which cancelled due to crewing. His polished display included a slow pass with canopy pushed back whilst he waved to the crowd before finishing with a fast pass, demonstrating one of the best 'blue notes' I've ever heard! With the conclusion of the flying display it was time to head home before the possibility of any more showers become reality. Thankfully most had stayed away all day, except the edge of one which passed overhead. The spirits of the day were never dampened though, and the show boasted an excellent variety of flying items performing wonderful displays such a small and unique venue. My mind is made up for next year already - I want to be there. I just hope that Air Tattoo Event Services' contract is renewed too, as the show ran without a hitch.